By Khadidja Doucoure, Regional Gender Coordinator and Steven Jonckheere, Knowledge Management Officer for IFAD in West and Central Africa. IFAD works in some of the most remote and environmentally fragile locations, and often with particularly marginalized and disenfranchised populations. The Fund is committed to reaching rural young people, who will migrate in search of opportunity unless we make agriculture an attractive and profitable enterprise. IFAD also is targeting women – who make up almost 50 per cent of the agricultural labour force in sub- Saharan Africa - and other vulnerable groups. In West and Central Africa high fertility and declining mortality rates are resulting in an increasingly young population with a current median age of less than 18 years. The region is also experiencing the highest rates of urbanization in sub- Saharan Africa, with over half of the population expected to be in cities by 2020 as compared to 2030 for SSA as a whole. While the attention of policy makers has increasingly focused on the status of youth given concerns regarding employment generation, women remain central actors in both economic activities, particularly in agriculture, as well as managing household welfare. Although women are expected to expand their role in the labour force in West and Central Africa, there remain significant differences in boys’ and girls’ school enrolment rates, particularly at the secondary and tertiary levels, and the legal rights of women to property remain tenuous in many countries which follow customary rights. Moreover, the prevalence of violent civil conflicts discriminates against women and youth and weakens their ability to be fully engaged in productive activities. Significant progress has been made over the last years IFAD-supported projects in the region in implementing their targeting approaches and promoting gender equality and the inclusion of young people. However, these advances in gender equality are still fragile in some countries, as overall economic and social progress is hindered by political and social instability. In a context with social and economic inequalities, women and young people continue to be more vulnerable and have less opportunities to participate in and benefit from economic activities. In addition, at project level more attention needs to go to monitoring and documenting the results of these efforts, especially to see what is happening at household level. Having a good targeting strategy from the onset of a project is key for success. 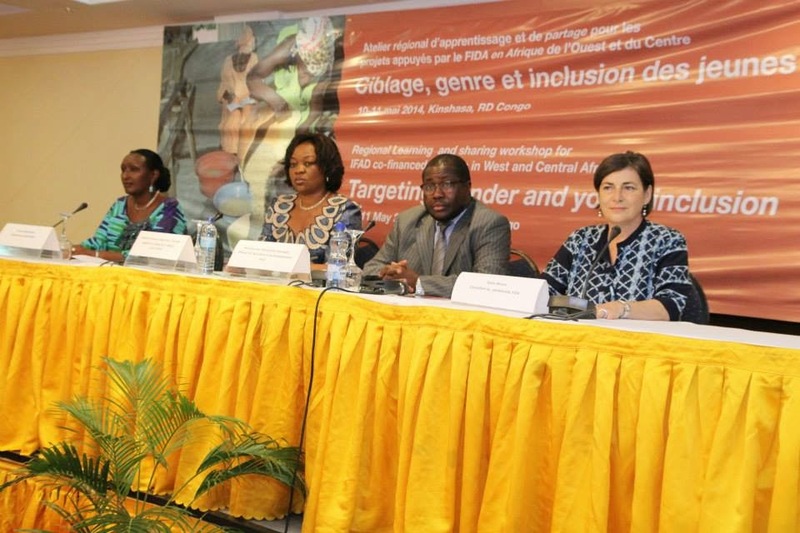 The West and Central Africa Division of IFAD, under the leadership of the Regional Gender Coordinator Ms Khadidja Doucoure, therefore sponsored a two-day workshop on the theme “Targeting, gender and youth inclusion” in Kinshasa from 10 to 11 May 2014. The aim this event was to help gender focal points develop a capacity to improve the poverty-reducing performances of their projects by using methodologies and analytical tools that focus on targeting, gender and youth inclusion. More than 70 people participated from 36 projects, mainly gender focal points and monitoring and evaluation officers. During the workshop a wide range of experiences were shared by project representatives. The Agricultural Value Chains Support Project in Senegal, the Ruwanmu Small-Scale Irrigation Project in Niger, the Pastoral Water and Resource Management Project in Sahelian Areas in Chad and the Support to Agricultural Development and Marketing Project from Ivory Coast showcased some best practices with regards to implementing targeting strategies. Furthermore, the Agricultural Commodity Chain Support Project in Burkina Faso, the Food Security and Development Support Project in the Maradi Region in Niger, the Rural Finance and Community Improvement Programme in Sierra Leone and the Northern Rural Growth Programme in Ghana talked about how they are addressing gender inequalities and discrimination by focusing on areas which can empower women economically and socially, including access to land, water, education, training, markets and financial services. Finally, to understand how the engagement of the rural youth in IFAD’s operations can be improved, experiences were shared from the National Programme to Support Agricultural Value Chain Actors in Guinea, the Rural Enterprises Programme in Ghana, the Agricultural Value Chains Support Project in Senegal, the Livestock and Horticulture Development Project in Gambia and the Community-Based Natural Resource Management Programme - Niger Delta in Nigeria. While the first part of the workshop focused on the sharing of good practices, during the second one emphasis was put on the operational side. First, discussions were held on how projects are being assessed with regards to their performance on targeting and women empowerment. Secondly, methodologies and analytical tools that focus on targeting, gender and youth inclusion were presented for different types of projects (value chain, rural finance, enterprise development and natural resource management). Finally, an interactive discussion highlighted the importance of using monitoring and evaluation systems to track a project's performance related to targeting, gender and youth inclusion in monitoring and evaluation systems. Consistent collection and analysis of gender and age disaggregated data and information is important to systematically identify and address gender issues and disparities. Routinely data collection and analysis allow project managers to make adjustments to improve projects based on feedback about the results being achieved. setting up mechanisms for sharing experiences amongst projects.